Thanks to Kraft Foods for sponsoring this post. While I’m a little distraught over how I have seemingly misplaced an entire year, I’m so not mad about the actual fact that it’s December. It’s a magical month that has so far produced one cold and rainy 10k race in a Wild West movie set, one lovely Christmas tree that has not yet been attacked by baby Godzilla, all the sugar cookies we can eat, and one epic birthday pie. (Post coming soon!) We still have my own birthday coming up, as well as Christmas and visits with both sides of our family—so basically, this is the best month ever. Wouldn’t you say such a great month deserves a great cake? It’s covered with a shiny chocolate ganache made from several different types of chocolate, for a richness and depth of flavor you can’t get from using just one brand or one variety of chocolate. And I pulled out all the decorating stops—meringue mushrooms! 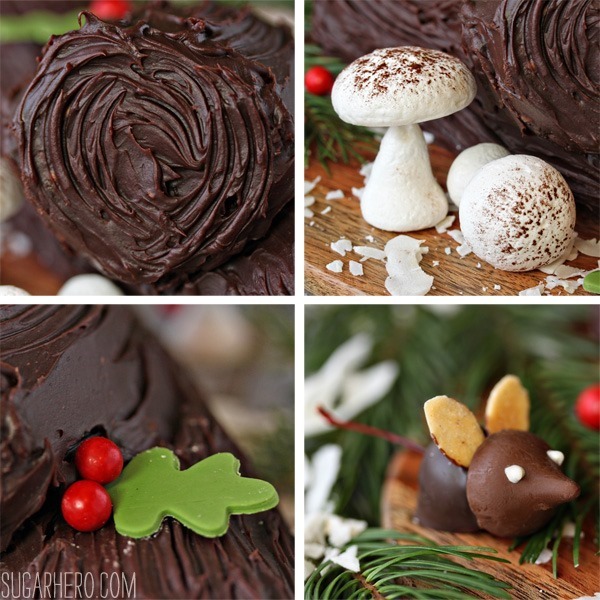 Chocolate-cherry mice! Fondant leaves and red sixlet “berries!” I also raided a local Christmas tree lot for cast-off branches to use for decorating the backdrop, but that’s a sneaky story for another day. 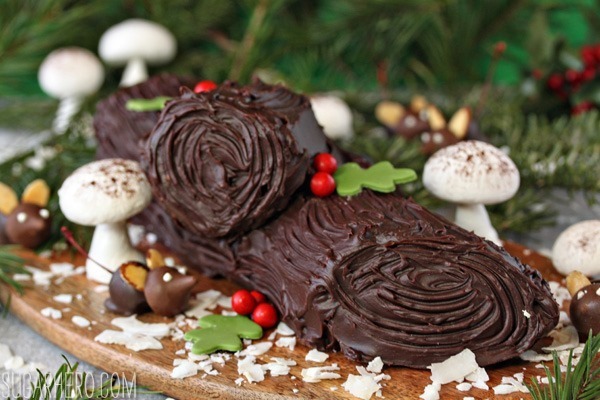 If you’ve never made a yule log cake before, this is a great recipe to start with. The chocolate cake itself isn’t the most flavorful (that’s why I added chopped chocolate in the peanut butter filling, and a thick chocolate coating on the outside) but it is one of the most forgiving recipes. 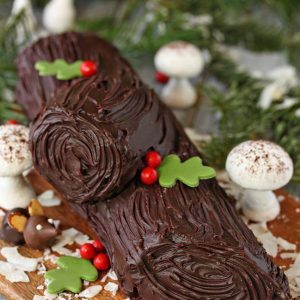 Many buche de noel and jelly roll cake recipes crack at least a little bit, no matter how gently you handle them, but this one performed like a champ and I had zero cracking. I even zoned out and rolled it the wrong way the first time—widthwise instead of lengthwise—and when I unrolled it and re-rolled it a second time, it held up beautifully. 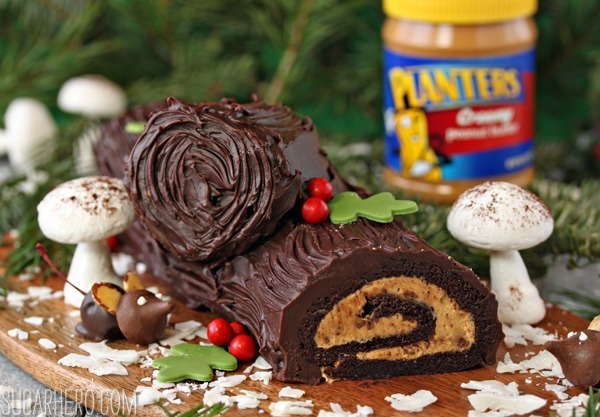 So don’t be scurred—this could be your year to eat a cake shaped like a tree! Let’s do this thing! More excellent news: Kraft is offering a little help for the holidays right now, and you can save up to $20 with the #KraftHolidaySavings coupons, exclusively at Target! There are coupons for everything from cheese to coffee to (oh yes) peanut butter. 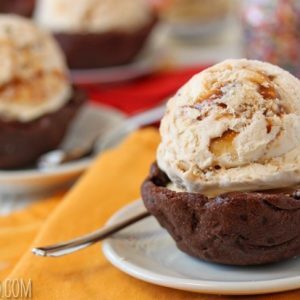 If you head on over to Target.com you can see all the coupons available—there are some really great offers that make holiday cooking and baking super easy! 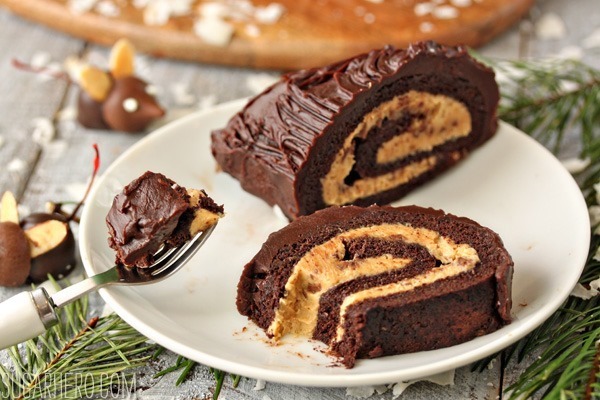 This beautiful wintry dessert is made from a light chocolate sponge cake wrapped around a rich peanut butter filling and finished with a shiny chocolate glaze. Preheat the oven to 350 F. Line a 10x15-inch baking sheet with a 1-inch rim with parchment paper. Spray the paper with nonstick cooking spray, dust it lightly with flour, and tap out any excess flour. Separate the egg yolks from the whites. Combine the yolks, 6 tablespoons of sugar, and 1/3 cup unsweetened cocoa powder in a mixing bowl fitted with the whisk attachment, and whip for 2-3 minutes, until lightened in color and thick. When you lift the whisk from the yolks, the yolks should slowly drop down from the whisk like a ribbon. In a separate mixing bowl, begin to whip the egg whites with a clean whisk attachment. When they are frothy, add the cream of tartar and continue whipping. Once soft peaks have formed, slowly add the sugar, a tablespoon at a time, until all of the sugar has been added, and the egg whites are shiny, thick, and hold firm peaks. I like to look for the texture of shaving cream. Fold about a quarter of the egg whites into the yolks, stirring gently to loosen and lighten the yolks. Once incorporated, stir about half of the remaining whites in, and after those are in, fold in the remaining whites. Scrape the cake batter into the prepared pan and gently smooth it into an even layer. Bake the cake for about 15 minutes, until puffed and a toothpick inserted into the center comes out clean. While the cake is baking, stir together the remaining 2 tbsp cocoa powder and 2 tbsp powdered sugar in a small bowl. After the cake comes out of the oven, let it sit for about 5 minutes to cool down slightly. While it is still warm, sift about half of the cocoa-sugar mixture on top. Cover the cake with a clean kitchen towel, and invert the cake onto your work surface so it’s resting on the towel. Remove the baking pan and peel the parchment off the top. Sift the remaining cocoa-sugar mixture on top. Roll the cake around the towel while it is still warm—doing it while it is warm helps keep it from cracking later on, and rolling it around the towel makes it easier to unroll and prevents it from sticking to itself. 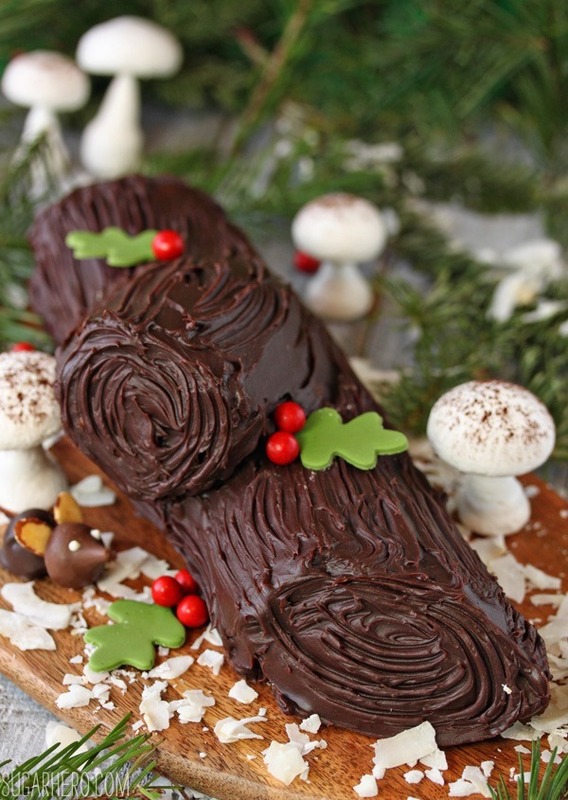 Make sure you roll the cake lengthwise if you want a long, thin yule log. Rolling widthwise will produce a shorter, fatter log with more rolls inside. Let the rolled cake sit and cool completely before assembling. Combine the peanut butter, powdered sugar, butter, vanilla, and salt in a large mixing bowl. Beat on medium-low speed with a paddle attachment until well-mixed. Add the heavy cream, mix on low until it’s incorporated, then raise the speed to medium-high and beat for a few more minutes until light, fluffy, and smooth. Filling can be made several days in advance and kept in an airtight container in the refrigerator. Bring to room temperature before using. 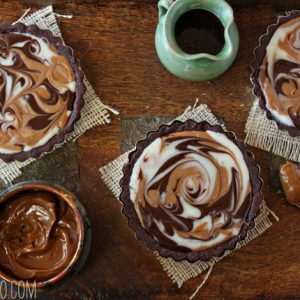 Place the chopped chocolate in a small bowl. Pour the heavy cream and corn syrup into a small saucepan, and bring them to a simmer. Once they’re almost boiling, remove the pan from the heat and pour the heavy cream over the chopped chocolate. Let it sit for a minute, then gently whisk them together until the chocolate is smooth and shiny. Add the salt and room temperature butter, and whisk until combined. Press a layer of cling wrap on top of the chocolate. If you’re making the chocolate glaze in advance, let it sit at room temperature until it thickens to the texture of peanut butter, for about 4-6 hours. If you don’t have that kind of time, refrigerate it until it chills and thickens. Check it regularly to make sure it doesn’t get too cold and firm. It should have body and hold its shape, but be easy to spread, like frosting. To assemble the cake, unroll the cooled cake from the towel. Spread the peanut butter filling on the center of the cake. It will spread out as you roll it, so leave a small margin bare at the bottom of the cake. 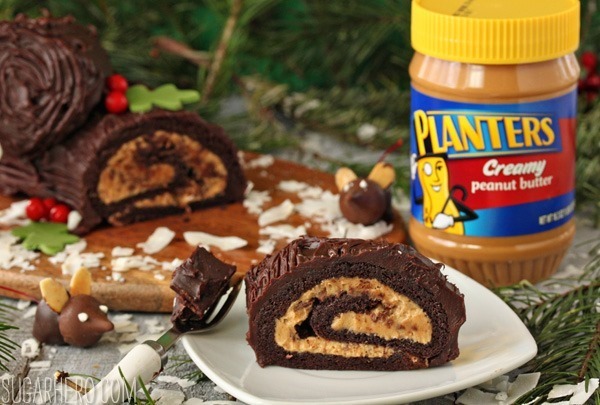 Sprinkle the 2 oz finely chopped chocolate on top of the peanut butter filling, and roll the cake back up. Use a serrated knife to slice off one end of the cake at an angle. Press the angled end into the top of the cake so that it forms a stump that sticks out. The frosting from the cake should help it stick, but if it doesn’t seem stable, use some of the chocolate glaze to help it stick. Transfer the cake to the serving plate. Cover the outside of the cake with the chocolate glaze, and use a spatula and/or a fork to draw lines in the glaze to make it look like tree bark. Refrigerate the cake to firm everything up for an hour. Just before serving, finish the cake with the decorations of your choice: I like meringue mushrooms, chocolate mice, fondant leaves, red candy berries, and/or snow made out of powdered sugar or coconut. The cake will keep for several days in the refrigerator. Use the best chocolate and cocoa powder you can find to make this cake really special! If you don’t want to miss a SugarHero recipe, you can subscribe to get new posts by email, subscribe to the SugarHero RSS feed, become a fan on Facebook, or follow on Twitter. Ooh, and let’s not forget Pinterest. (I love Pinterest.) Thank you!